“Although the 16 Days of Activism Against Gender-Based Violence Campaign is a worldwide campaign, it is somehow absent in our rural Syrian communities. This is not due to lacking awareness or concern, but the non-existence of initiatives and opportunities for organizing such a campaign, despite its importance”, Lama reflects on the yearly 16 days of activism. Lama is a young working woman in central rural Syria, who has led the organization of the 16 days of activism in Emissa’s community centers. To raise awareness for gender-based violence, its consequences, and the shared responsibility of the society as a whole to say “no to violence against women and girls”, Emissa organized a variety of activities for a wide range of beneficiaries in our schools and community centers, as well as in cooperation with other civic entities. Lama is 29 years old, not married, and has graduated from university with a major in French literature. Her efforts to receive a diploma in education were put to a sudden end by the war. Nevertheless, she has been working as a teacher throughout the war, until she joined Emissa as the deputy coordinator for one of the community centers in besieged central Syria. Hiba is 19 years old, divorced, finished her education by the end of the 9th grade and has never worked. She participated in Emissa’s 16-days campaign activities and had a conversation with Lama about violence against women and her personal experience. 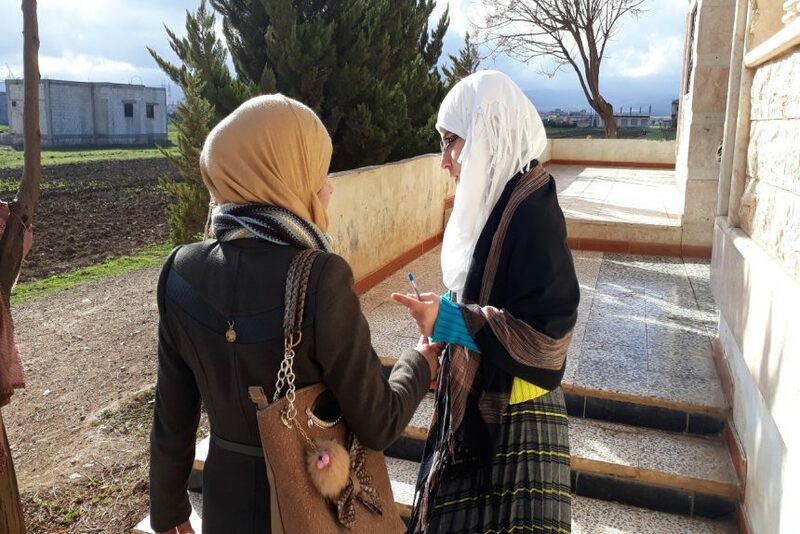 Lama and Hiba are two young women with different backgrounds and lives, yet they are united by the same conviction: gender-based violence and the attached stigmatization of women and girls has to end. “Early marriage is not a new phenomenon, it is deeply rooted in our culture, but it is a crime. It deprives children of their right to be a child and forces the label ‘woman’ onto young girls, preventing them from enjoying their right to education and gaining ownership of their futures. Not to mention the psychological and physical effects that early marriage has on young girls”, Lama opens the conversation. “I have frequently experienced violence and abuse through my ex-husband, who I got married to when I was far too young. My marriage lasted for six months only and it was filled with psychological and physical pain. But after all that pain there was peace – when I finally got divorced. Nothing of the kind would have happened to me if I was not a woman” Hiba says with tears in her eyes. Hiba explained that she had never heard about the campaign before, but that she was motivated by her own experience to participate in a session about early marriage. “The other women and girls seemed embarrassed when they talked about their experiences. I am sure they went through the same as I did, but I don’t feel ashamed to discuss my case in public anymore. However, my family was not happy with my participation, since it is shameful to be a divorced woman and not common to speak about such problems openly in our community”, Hiba says regretfully. The 19-year old reiterated that Emissa’s 16 days campaign had a highly positive effect on her own life, as she was introduced to some of her rights, in particular the right to education, which she was not aware of. “I am not sure about the impact of the campaign on the community, as it is a highly sensitive issue. Nevertheless, it is highly important to continue with awareness raising to create a change within the community. I wish I could deliver the knowledge that I now have about my rights to everyone around me, and I hope that my voice was heard by the girls and women suffering from the same challenges when I told them to be strong enough to say no – no to injustice, no to gender-based violence and no to oppression”, Hiba emphasizes.